Sunday morning brunch; shoe covers required. 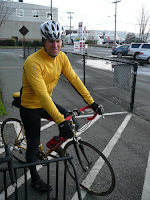 I met Mr. Dave at Chez Giro and joined him for a nice morning ride, from Phinney to Leschi and back. Brisk one at the start, but the sun did manage to join us for the end of the ride. Nice hill you live on, Giro. yes, I'm an addict alright . . .so that's what I look like from the front side on my bike. I dig the yellow. Good to see you last weekend Dave. Oh yeah, thats the front side, yet I prefer your back side...OHHHHHH! Fonz, good to see you as well. Apparently the photographer also likes my backside from all of the other cycling posts - seriously he needs to stop!